Bird droppings on your property are far more than just an aesthetic issue, although they certainly do not look pleasant (and can cause lasting damage to stonework due to their acidity). There are also very serious health and safety implications involved, which means that it is crucial to get expert guano cleaning services from trained technicians such as those from PestControl.co.uk. Disease. Guano can contain three serious diseases; psittacosis, cryptococcosis and histoplasmosis. The latter two grow in the soil with the droppings and are fungal diseases. Psittacosis is bacterial and is contracted by inhaling airborne particles of the guano. 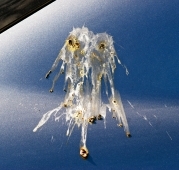 This is one of the reasons why it is dangerous to try to clean up bird mess yourself. Parasites and Insects. If you have a large quantity of guano on your property then you may well also have a bird nest. These can contain a number of parasites and insects which can infest your home and cause further problems. If a bird dies on your property, this is likely to attract even more insects. Slip Hazard. Guano on the ground is a serious slip hazard, especially on stairs. This can lead to a number of serious injuries. Blocked Gutters. Birds nests and large quantities of guano can lead to blocked gutters, which may create water damage in your home. This can also create the conditions for further pest control problems, as many pests are attracted to damp conditions, such as woodworm, silverfish and rodents. It is inadvisable to attempt guano cleaning yourself as it requires certain safety procedures to be undertaken to ensure that it is not dangerous. As noted, inhaling particles of guano can have serious consequences for your health. Also, it is often found in hard to reach places which makes an accident more likely. The pest control technicians from PestControl.co.uk are fully trained to carry out guano cleaning services safely and effectively. We have many years of experience and after a quick survey of your property will be able to identify the best way of going about making your home or business back to looking its best. The first step will be to remove any nests and/or debris created by the birds. Then the area will be powerwashed in order to remove the staining, and disinfected with a special chemical such as PX Ornikill to return the area to complete health. As always of course, prevention is better than the cure. We can also suggest the best bird deterrents for your property to make sure that it does not get in to such a bad state again if you wish.